Combine all ingredients. Beat well. Dough will be stiff like cookie dough. Spread into 2 9x9 pans. Bake for 1 hour at 350 degrees, checking at 50 minutes. Frost with cream cheese frosting or your favorite. Pour over 6 Cheerios, rice crispies or chex. Pour into a 9x13 inch pan and let set up. Cut into squares. Add ½ teaspoon cinnamon and blend together in a large bowl. Add one cup of rum if desired. Refrigerate. 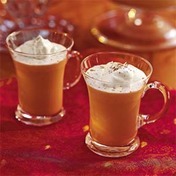 Pour into coffee cups, with a large spoonful of Coolwhip and a sprinkle of nutmeg. Makes 32 ½ cup servings. Bake a lemon cake mix on a sheet cake pan according to directions. While still warm, poke holes in the top of the cake. Pour 1 large can of crushed pineapple with juice over top of cake and put into refrigerator to cool. Prepare 1 package instant lemon pudding mix using ½ cups milk. Fold in a 12 ounce carton of Cool Whip and spread on top of cake. Keep refrigerated until ready to use. Mix all together. Drop by teaspoons on lightly greased cookie cheet. Bake at 350 degrees for 10-12 minutes. Brown meat, onions and garlic. 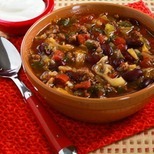 Stir in soups, enchilada sauce, milk, olives and green chilies. Bring to a boil. Remove from heat. Spread ¼ of the sauce in 9x13 greased pan. Layer ⅓ of the tortillas, ¼ of the sauce, and ⅓ of the cheese. Repeat these layers twice more ending with the cheese. Cover with foil. Bake 30 minutes at 350 degrees. Remove foil and bake 20 more minutes or until bubbly and hot. One big onion chopped fine. 3 cups chicken broth. If using canned broth, add a little water if necessary to make the same amount as the rice. Melt ⅓ stick of butter in a heavy Dutch oven or kettle that has a solid lid to cover it later. Add chopped onion and fry until softened, stirring. Add rice, chili powder, pepper, cinnamon, cloves, poppy seed and turmeric. Stir and heat all together a bit. Add chicken broth and bring to a rolling boil, salt to taste, cover, remove from heat and let stand for at least 5 to 10 minutes. While steeping, melt ¼ stick butter in a skillet, add cashews, raisins, and french fried onions. Heat thoroughly (not too long). When rice is finished steeping, fluff, put in a bowl, sprinkle nut raisin onion mixture on top. Spread in a 9x13 pan. Bake 20 minutes at 350 degrees, stirring 3 times with a fork while baking until crumbly. Cool. Remove ⅓ of crumbs and set aside. Pat down remainder in bottom of pan. Add 1 C sugar gradually. Fold in 8 oz Cool whip. 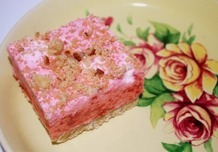 Spread over crumbs, sprinkle with remaining crumbs and freeze. Cut into squares and serve. Heat until cheese is melted and vegetables are tender, being careful not to scorch. I received this from a dear friend, Pat Street, from St. Paul’s Methodist Church. It’s simple yet so delicious. Makes about two quarts. Mix pretzels, pecans 3 tbl sugar and melted butter in a bowl.Press into a 9x13 baking pan. Bake at 400 F for 10 minutes. Mix remaining 1 c sugar with cream cheese. Stir in whipped topping. Spread over cooled crust. Dissolve gelatin in boiling water. Stir in frozen strawberries. Let stand until mixture begins to set. Pour over cream cheese mixture. Chill until set. A popular dessert for UMW unit meetings. In melted butter, sauté onion, garlic, and curry powder for 5 minutes. Add flour and stir until smooth. Combine bouillon and water and slowly add to flour mixture. Stir until thoroughly blended. Add apple and chicken. Simmer covered for one hour. Add cream and heat thoroughly without boiling. Serve with white rice, preferably jasmine and small dishes of a selection of the following: bananas, chutney, coconut, raisins, crumbled bacon, diced avocado, chopped green pepper, celery, tomatoes, green or ripe olives, plain yogurt, peanuts, chopped cucumber. Served with great success at UMW Unit Luncheon in conjunction with our mission study of India. 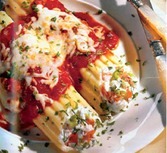 Cook manicotti according to directions, drain, rinse and cover to keep from drying out. Fry sausage until light brown and drain. 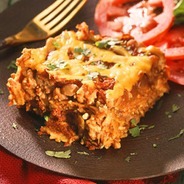 In a large bowl, mix cottage cheese, mozzarella, parmesan, sausage and tomatoes. Spread a thin layer of spaghetti sauce in bottom of two greased 9x12 pans. Stuff manicotti and place in pans. Pour remaining spaghetti sauce over all, sprinkle with more parmesan, cover with foil, cut small slits for venting and bake at 375 F for one hour. Melt ¼ c butter. 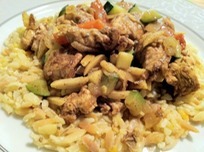 Stir in ½ c flour, 3/4 tsp salt and ¼ tsp pepper, 5 tsp granulated chicken bouillon. Add 2 c milk. Cook and stir until thick. Add to undrained vegetables. Add 2 to 3 c shredded cheddar cheese and heat just to melt. Whisk in ½ c oil and 1 TBL poppy seeds. Coil onion until limp. 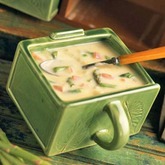 Put it and other ingredients, except shrimp and orzo, in a soup pan and cook for 15 minutes. Add cooked shrimp and cooked orzo and heat thoroughly. Beat butter, brown sugar, honey and egg until smooth. Combine flour, baking soda, salt ,cinnamon and stir into butter mixture. 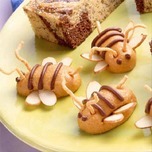 Drop by teaspoonfuls onto ungreased cookie sheet. Bake 7-9 minutes at 375 F until set and light brown. Let stand 3-5 minutes on cookie sheet and move to rack to cool. Jacob Bryan won the “Best Cookie” contest at the Trinity church picnic on August 5, 2001 with this recipe. Mix the first four ingredients. Add milk, mix well. Roll in balls. Chill for 20 minutes. Flatten with a glass. Chill for 30 minutes. Dip in melted candy coating chocolate or 2 c semi sweet chocolate chips melted with 2 TBL shortening.